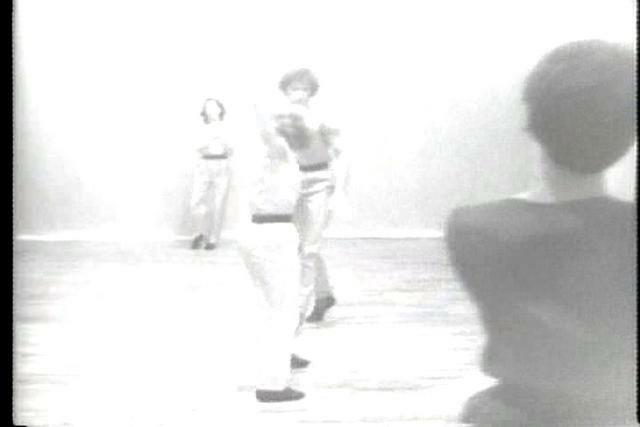 Inaugurating The Kitchen’s Fall 1979 Dancing in The Kitchen series, Molissa Fenley premiered piece Mix on September 13. In this work Fenley, John Bernd, Kate McLaughlin, and Elizabeth Streb used their bodies as instruments: clapping, stamping, beating sand blocks, and shaking maracas at an insisten rhythm that was augmented by Judy Fogelman controlling a mixer, echo machine, and phase shifter. The four dancers repetitively jogged, bounced, and hopped for 50 minutes, highlighting the singularity of Mix as they appeared in costumes designed by Carmel Johnson in different colors—Bernd in purple, Fenley in orange, McLaughlin in blue, and Streb in red.